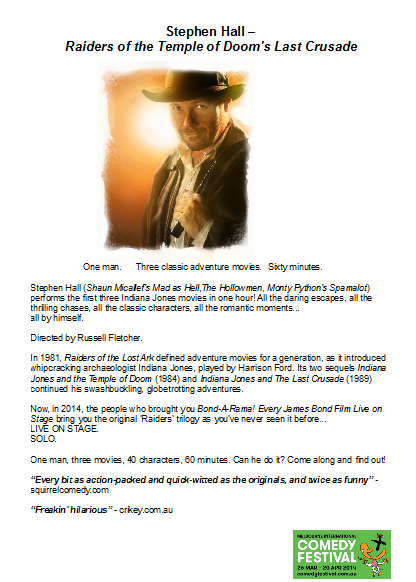 ​Raiders of the Temple of Doom's Last Crusade was a one-man stage show, written and performed by Stephen Hall. In the show, Hall performs edited versions of Raiders of the Lost Ark, Indiana Jones and the Temple of Doom and Indiana Jones and the Last Crusade... all in one hour. The show is a result of Hall's love for the Indiana Jones trilogy, and in it, he sets himself the task of playing some 40 characters, while recreating all of the big-budget set pieces from these three blockbusters, with little more than a map of the world, a steamer trunk, a knack for vocal mimicry and some rather dodgy shadow puppetry skills. The show premiered at the Melbourne Fringe Festival in 2013, where it sold out. It was then revived for a second successful season in the Melbourne International Comedy Festival in 2014.